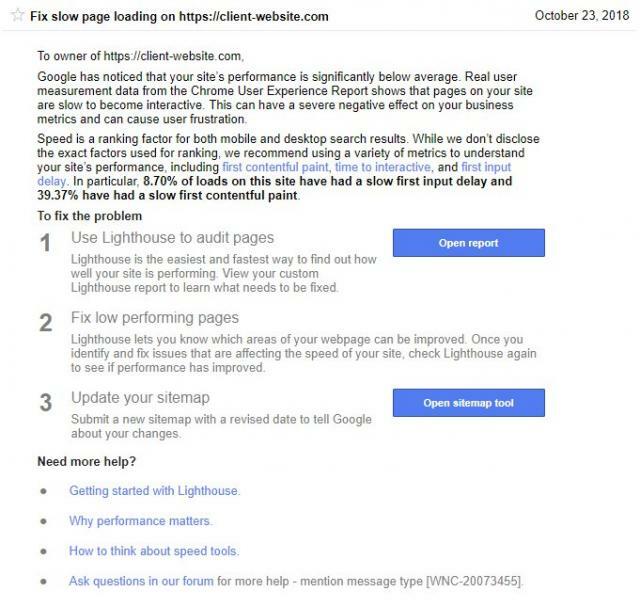 Google is sending out a new warning and notice via Google Search Console to let webmasters know they need to fix their really slow pages. The notice starts off by reading "fix slow page loading on domain.com. Google has noticed that your site's performance is significantly below average. Real user measurement data from the Chrome User Experience Report shows that pages on your site are slow to become interactive. This can have a severe negative effort on your business metrics and can cause user frustration. Speed is a ranking factor for both mobile and desktop search results. While we don't disclose the exact factors used for ranking, we recommend using a variety f metrics to understand your site's performance, including first content paint, time to interactive, and first input delay. In particular, 8.70% of loads on this site have a slow first input delay and 39.7% have had a slow first contentful paint. It then goes on to suggest opening the report in Google Search Console and read more.